Nothing says fall or autumn to me like a crisp apple. Food magazines are filled with recipes calling for apples, and I’m a happy reader, cutting out those recipes and planning my own kitchen adventures with apples. When I found a recipe card for an apple bread, written in my grandmother’s writing, I thought it would make a perfect post as we begin the first full week of fall. Grandma didn’t leave me too many recipes because she rarely wrote them down. Her Hungarian mother passed on her recipes to Grandma and her eight (!) younger sisters by teaching them to cook and bake “hands-on” in her Brooklyn kitchen. Unfortunately, I never got Grandma to write down more of her recipes. She was one of those terrific cooks who didn’t really need a recipe, unlike her granddaughter. I decided to make her recipe into muffins and added more spice to my version. I wanted to bite into a spicy muffins that had good-sized pieces of almond and enough grated apple so I could really enjoy the textures and flavors. My favorite apple to use here is Granny Smith, but any tart, crisp apple will work just fine. In the interest of making a healthier muffin, I substituted honey for white sugar, white wholewheat flour for white flour and yogurt instead of sour cream, that classic Hungarian favorite. Happy Fall and I’m remembering that I began this blog in the fall of 2010, just two years ago. I’m enjoying writing to my readers more than ever, and so appreciate your presence in my life – and, especially, in my kitchen. 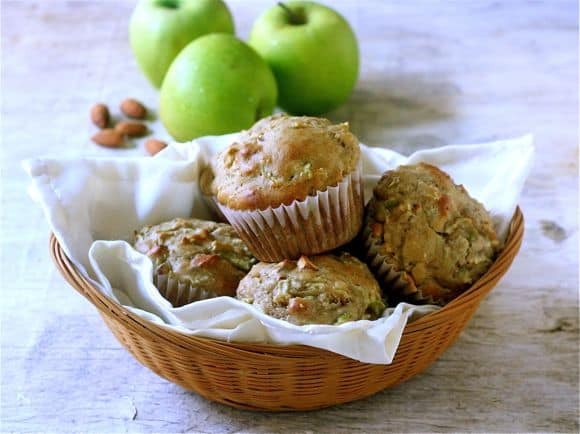 A spicy muffin studded with chunks of toasted almond and grated apple. Using a standing mixer with a paddle attachment, or a handheld mixer, beat together at medium speed the butter, eggs and honey. Add the grated apple and vanilla. Mix well. Add the flour, soda, spices and salt and mix until just blended. Using a rubber spatula, stir in the yogurt, milk and chopped almonds, making sure batter is well combined. Using an ince cream scoop, fill muffin cups. Bake 20 minutes. Cool on racks. Happy blog-anniversary, Liz! The recipe looks perfect for fall; pretty photo, too! Carol, thanks – we are still waiting for fall here but the days are shorter and fingers crossed for cooler weather. This is a lovely apple recipe with all this wonderful spices in it. This will help in surviving that summer is gone. Love the recipe, the story, the photo, and the healthy renovation! Happy blogiversary! You’ve come a long way, friend! Thanks, Stephanie, you have and continue to be so helpful and supportive – grateful for your friendship. Looks tasty! Out of interest sake, I put the recipe into WW to figure out the points. If it makes 12 muffins they’re 4pts each. Not bad. I wish I could find a muffin for the 2-3pt range. Try my “Heart-Healthy Berry Orange Muffins” – they might make the challenge for you. Happy 2 years! These muffins look great. Just trying to recover from the notion of 9 daughters. And the last great-aunt died last month, the youngest of the 9! Congrats on your blog anniversary! I have never celebrated any of mine, I love that you are. The photo is beautiful Liz and of course, I am dying to try the recipe all made over 🙂 So sweet that this is your Grandma’s recipe too. How long have you been blogging, Wendy? Liz these look scrumptious! And your photography is just gorgeous with the sunlight bouncing off those perfect muffins. Love the heritage and family story with this recipe and that you made some healthier swaps. Grandma would be proud! Averie, thanks – I hope my Grandma would approve. Great muffins, Liz! I haven’t made muffins in so long (I’d eat them all!) and love the mix of ingredients in these — happy Bloggaversary to you. How wonderful that you have some of your grandmother’s recipes! These are healthy enough to make and enjoy without the guilt of a sugar-y muffin overloaded with fat. With apple sesaon in full swing here in the Northeast, I will surely be making these soon with some local fruit. Happy Blogiversary, Liz….I’m looking forward to many more years of your great writing AND cooking! I envy you your apple choices – still summer here. Liz- Happy Blog-o-versary to YOU! Your photos are brilliant. Thank you for sharing a part of you and your family. I love how you spiced up the recipe and made it a bit more healthy. I know your grandma is smiling. Keep blogg’n. apple and fall are such comfort and warmth! Thanks, Denise. What are you up to?? These look perfect for the season. You’re so lucky to have these recipes that have stood the test of time, and serve up so many wonderful memories. Pinning this one to make over the weekend!!! Welcome home, Susan – eager to read more about your trip to Italy.